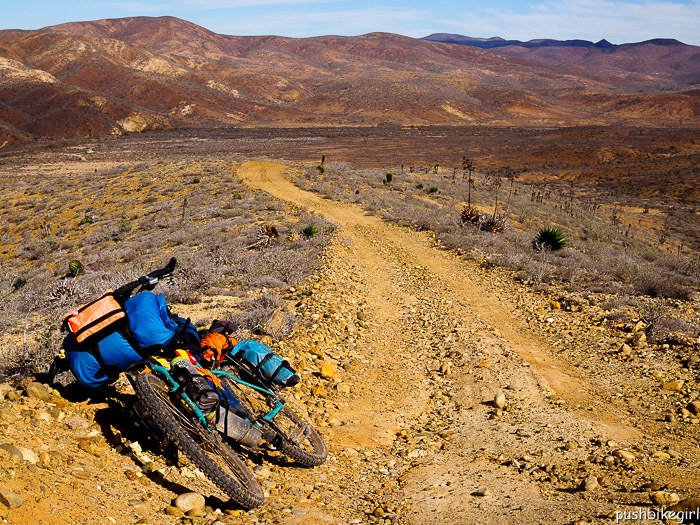 Are you ready for a great ride thru Baja California in Mexico? 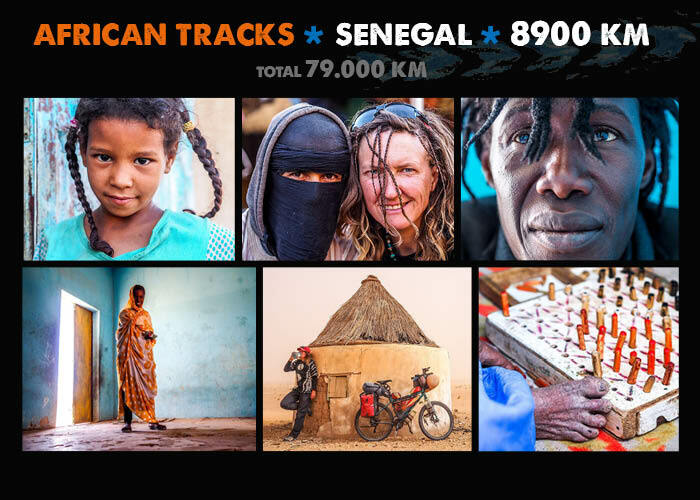 2700 beautiful kilometers on dirt are waiting for you! In many parts a sandy, rough trail with lots of rocks, washboards, damaged roads and water crossings. But the reward for this strenuous trail is a remote and extremely beautiful landscape with extraordinary plant life. The beaches are amazing and the camp spots nowhere better than there. Sadly, there is hardly any wildlife. But watch out for Tarantulas ? 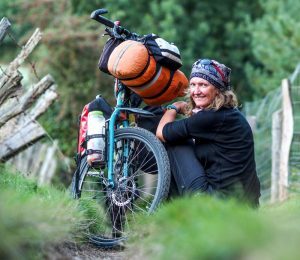 As a world cyclist with the normal 6 panniers Ortlieb setup the trail is no fun. I reduced my weight and bags lately anyway but of course still carried more than a short term bikepacker who is only doing the trail and nothing else. 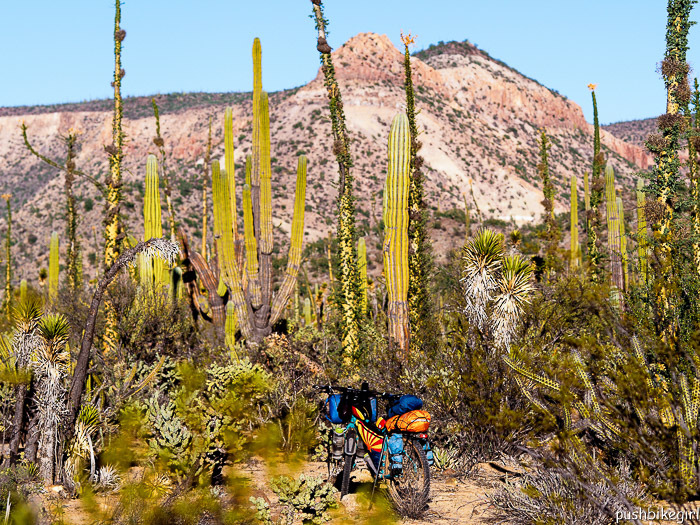 My tent and sleeping bag are heavier, I carry more clothes, a laptop and some luxury items which you wouldn’t carry if you were only on a short Baja Divide trail trip. As always it is possible to ride the trail even with more gear, as everything is normally possible. But make sure you get rid of as much of your gear as possible. A great possibility would be shipping a lot of your gear to La Paz, the last town of the trail before embarking to the mainland via ferry. And don’t worry – pushing the bike now and then is part of the fun ? I sent my Schwalbe tires to La Paz, but you can also send big heavy boxes. The bus postal system (yes, bus postal system) in Mexico seems reliable and is very cheap. Coming from the US, the border town Tecate, would be a great place to get this organized. I used the address of a Warmshowers host in La Paz. Watch out, it can rain! After rain, the Northern sections of the trail are almost impossible to cycle. I got caught two times and had big problems to get back to the main road to finally get water again. I was glad I had my rain gear, because the temperatures dropped a lot. Don’t underestimate the trail, especially on hot days. I would not do it in summer. Winter nights can be chilly. Temperatures might drop down below freezing. The days are warm and mostly sunny. I cycled the trail in December and January. Prevailing wind is north to south. Always carry some extra water if you are riding by yourself. If something happens to you or your bike you can’t rely on much help. There is hardly any traffic in a lot of the sections between resupply towns. Sometimes I didn’t see anyone for 2 or 3 days. You are by yourself, period. Purified water is available in every town where you can fill up your bottles in water shops. So, there is no need for buying plastic bottles! Mexican tap water is supposedly not safe to drink. I carried a water filter, but never used it. In most sections, there won’t be surface water anyway. 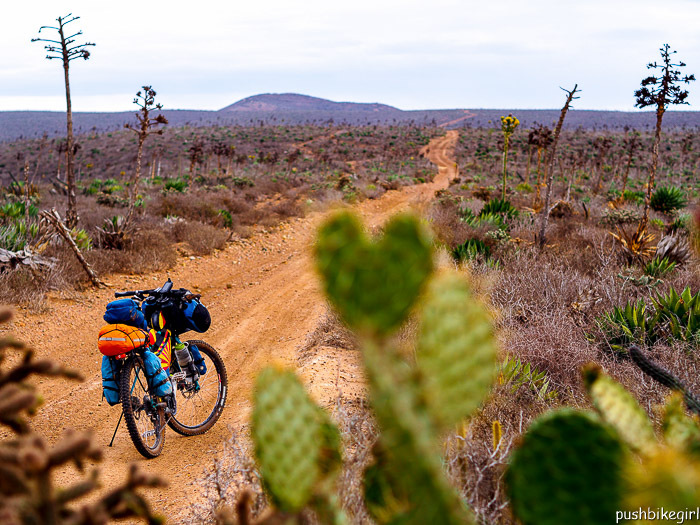 In the Southern Sections are more farms along the trail where you could ask for water, but I found almost none in the Northern sections of the Baja California. Food is no problem. Stores have a good selection of pasta, rice, nuts, dates and other dried fruits, tuna, chocolate and cookies, vegetables & fruits. 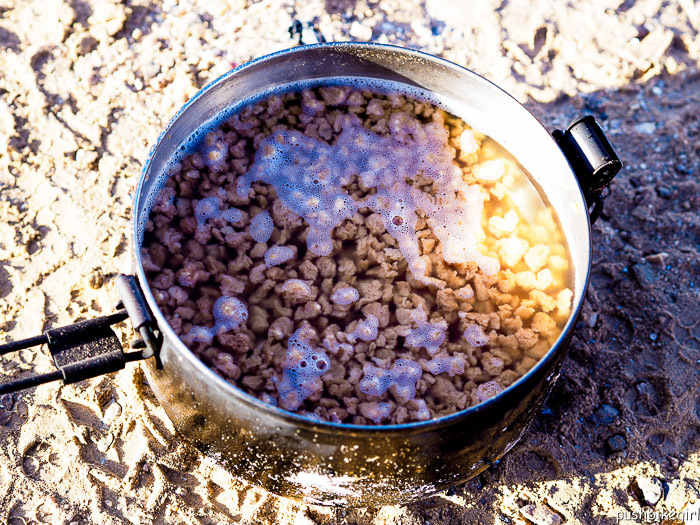 I liked soya a lot, which doesn’t take long to boil. 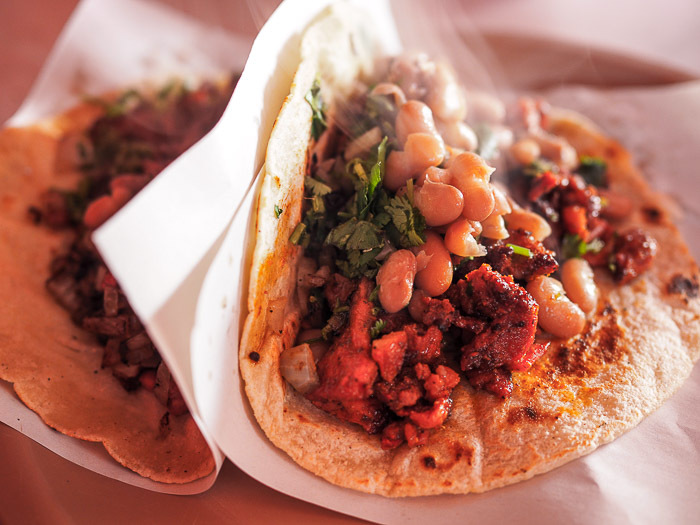 And of course, they have typical Mexican food in little Taco stands and little restaurants. Fish is everywhere available and very delicious. The Baja California away from the border seems to be a very safe area. I didn’t have any problems and always felt safe, but I know one cyclist who was robbed shortly after the border town Tecate. 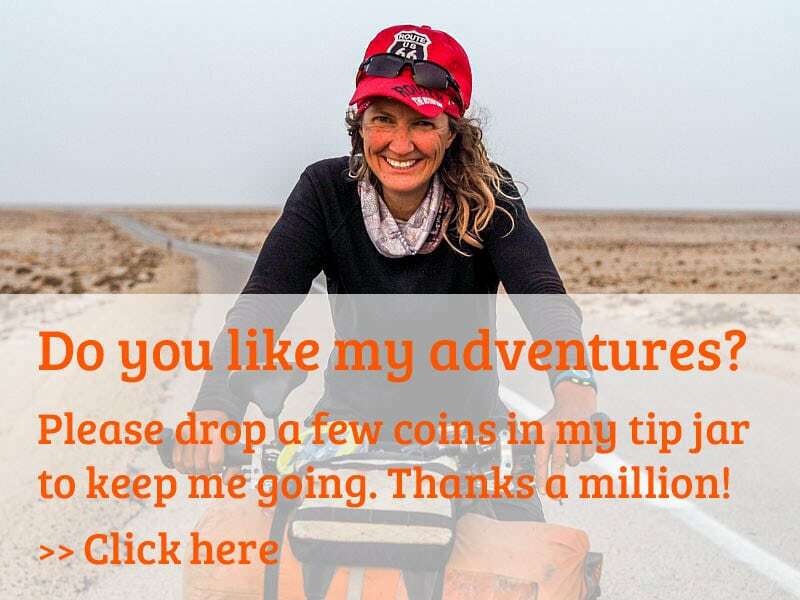 If you are tired of riding the trail or you only want to do parts of it then the bus system is very good and you can take your bike easily in the baggage compartment. 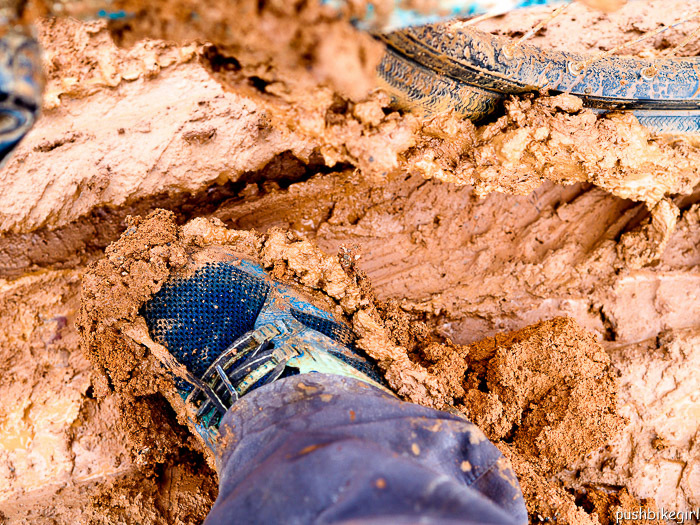 If you would like to avoid the most strenuous parts of the trail, this might be an option to consider. The Mex1 is in parts very busy and has no shoulder. Away from the cities it seems fine to ride. The condition of the trail will differ from year to year. 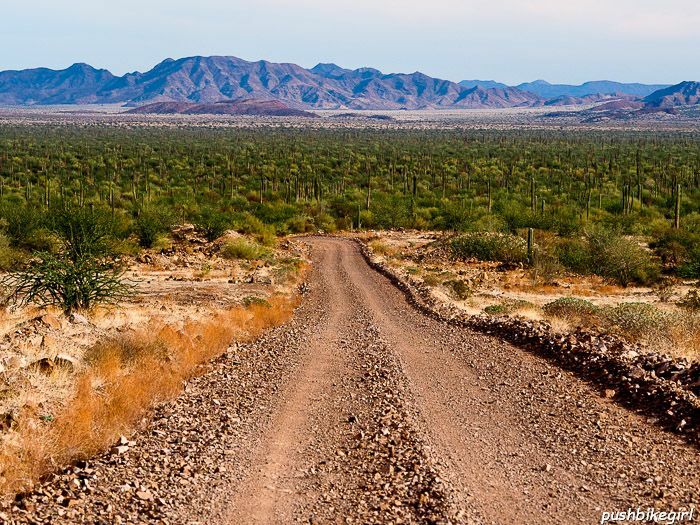 The Baja 1000 car race will take place in fall and might damage some parts of the trail in the Northern sections. Especially if they had a lot of rain while racing the tracks then the trail can be really bad, at least in some parts. Camping is of course for free. A night in a little hotel is between $10 and $20. A two-bed room is slightly more expensive. Food is affordable. You can get by with a few Dollars when you cook yourself. Fish Tacos are about $ 0,75 each. Some of the towns, like Mulege and San Ignacio for instance are nice and colorful. Others, mainly the towns along the MEX1 are just noisy and dirty. There is a great bike shop in Vicente Guerrero called FASS Bike and several good shops in La Paz. 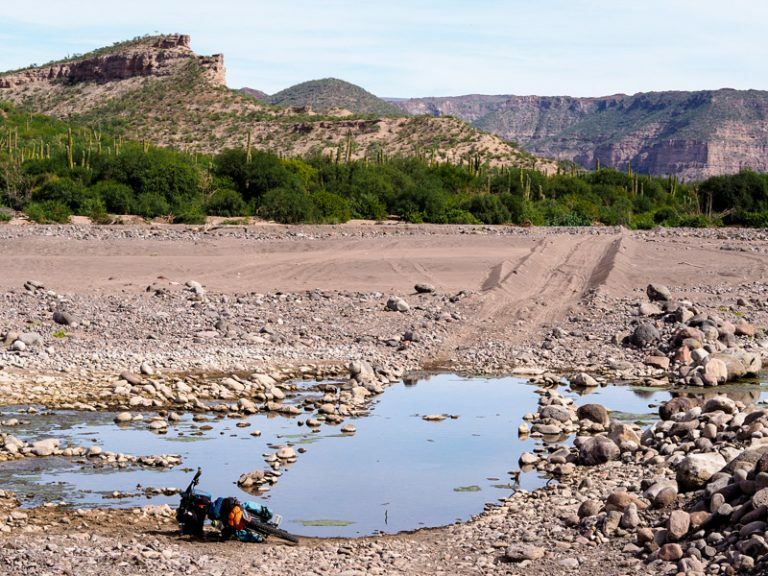 To follow the sections I am talking about below, please have a look on Nicholas and Lael’s Baja Divide website where they give you a lot of information and also talk specifically about the different sections. The Valley de los Cirios is mind blowing. I have been to a lot of countries and to a lot of different environments in my life, but I can easily say, that this area is one of the most fascinating areas I have ever seen. Section 9 Santa Rosalillita to Bahía de los Ángeles. The beaches are amazing too. I am not a beach lover, but those remote beaches you come across on this trail are superb. Section 10 Bahía de los Ángeles to Vizcaíno. I haven’t done the sections below La Paz where you ride along beaches as well, so I can’t comment this. Section 5 Colonet to Vicente Guerrero. The last 15 kilometers towards El Coyote were damaged through the Baja 1000 race. 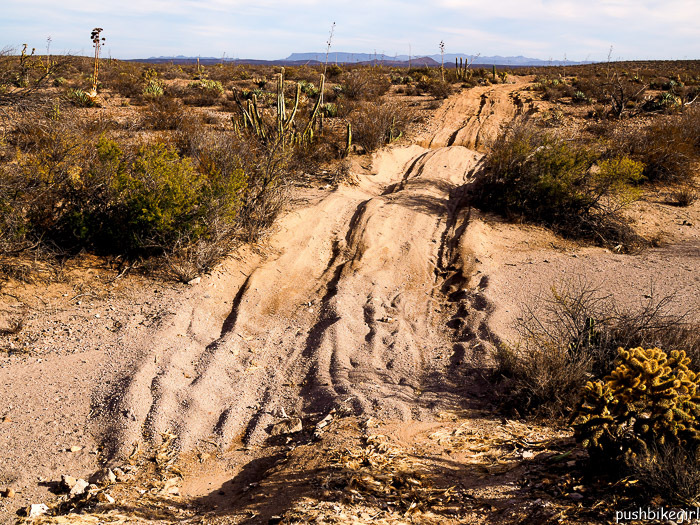 Section 7 between El Descanso and San Agustín where the track was also damaged through the Baja 1000 race. Section 11 Vizcaino to San Ignacio where there was a lot of sand and tons of cobble stones about 10 kilometers before San Ignacio. Section 13 El Dátil to Mulegé. From La Ballena to San Miguel there are lots of water crossings, cobble stones and damaged roads to traverse. With a big load and no front suspension it is a very strenuous section. GPS to follow the trail – I had an extra battery pack, which was important to have. I used the National Geographic map (North and South) to be on the safe side and found it very helpful to have an overview of the area and to be able to do some side excursions. I usually never carry a GPS, but this trail is in parts not possible to navigate without a GPS. The capacity to carry at least 10 Liters of water, especially when you are by yourself. The wider your tires the more fun you have. 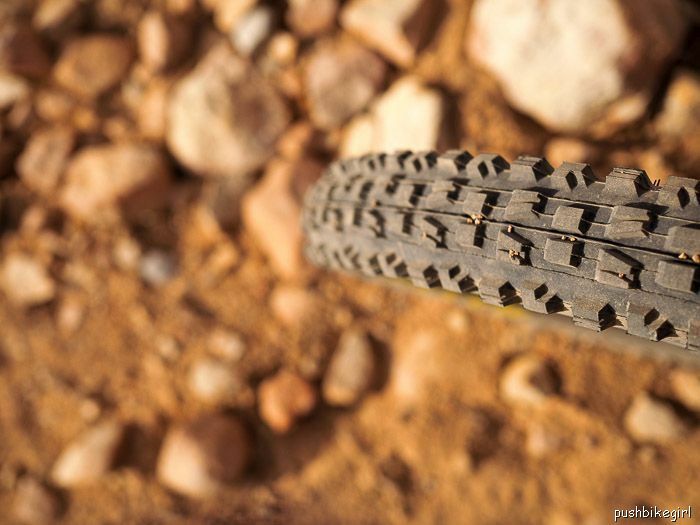 I used Maxxis Mignon 2.5 and had Slime and tire liners to be on the safe side in the cactus world (I had only one puncture). The lack of a front suspension was tiring for me. A stove. I used a Hobo stove which was a perfect idea. There is everywhere wood to be found and it burns within seconds. I personally would always carry a tent and a footprint as a protection from the thorns. And of course a sleeping bag. Lots of lubricant. Wax is very handy and available in bike shops. The chain needs it very badly in this dry, sandy environment. A good portion of fitness. I found riding in the dark with the moon light totally fascinating so a good bright head torch would be handy to have. If you have any more questions, feel free to ask. 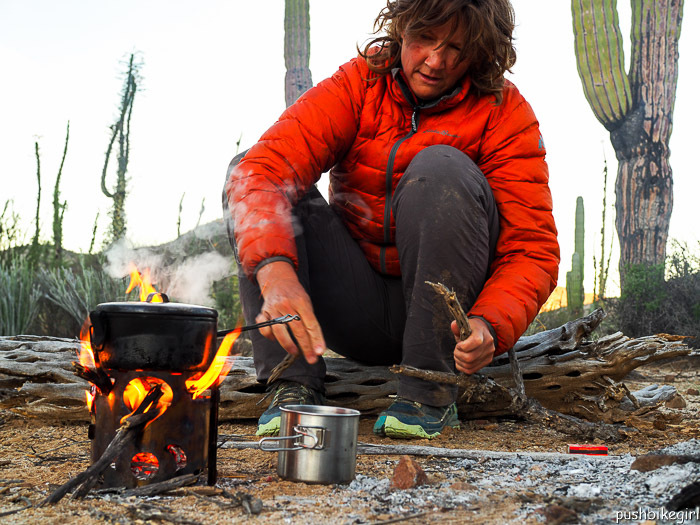 If you like to share your Baja Divide experiences you are more than welcome to do so. 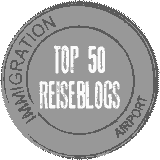 This is a great overview Heike! Good photo’s, as usual, and short but good information. Nice work! Thanks Cindy!!! I appreciate your feedback! Cheers and happy exploring – big hugs !!! Ich finde die “Gebrauchsanweisung” fuer den Trail eine tolle Idee. Deine gemachten Erfahrungen und Hinweise sind sicher sehr hilfreich fuer andere Radler und werden auch bestimmt dankbar angenommen. Dir, liebe Heike, wuensche ich noch viele spannende Entdeckungen. Bleibe gesund und hau rein. Freut mich Wolfi….DANKE und LG an den Rhein! Thanks for the great pictures and info. 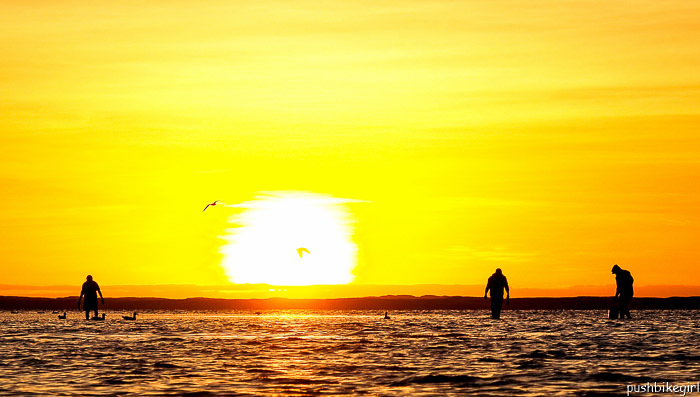 Baja is on my “gotta do” list ! Liebe Anneliese, DANKE Dir….nein leider habe ich keine Schlangen gesehen. Many thanks for the very useful and interesting ( specially about your equipment etc) story !!! For sure I can use several advices for our next trip!!! Happy safe ride and lots of greetings from Holland. ( ) very nice pictures !!!!!!! 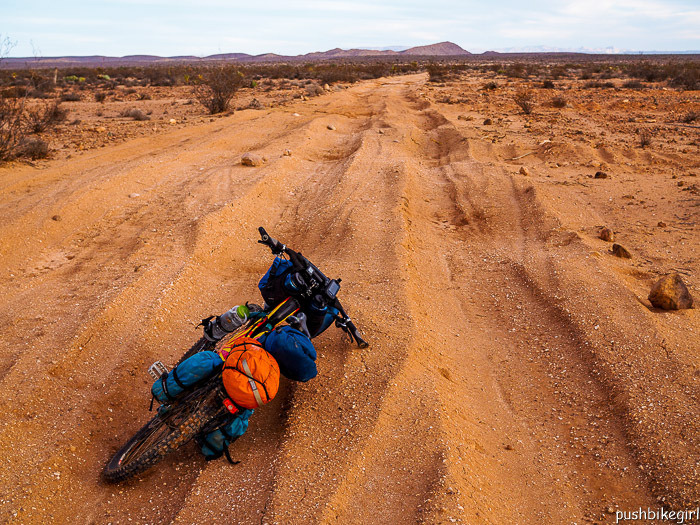 Would you say that ring this trail was probably better on a bike with fatter tyres minimum 3″ or indeed a fat bike? I have a feeling you would have struggled in the sand with your loaded bike with 2.5 inch tyres? Great respect to you for riding in these conditions though. yes the fatter the tires the better…..but it was possible with what I had! Great pictures btw! Were they taken with your Olympus OM-D? 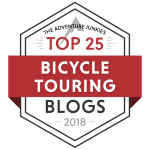 Nice writeup from a general tourer’s perspective, very helpful, thanks!